Take a superior knitwear brand with decades of experience and combine it with a tweed label with a history dating back through generations. The result is an autumn/winter collaboration with so much tenacity and style that the ensuing seasonal weather will not know what has hit it. Peregrine’s AW13 collaboration with the world-renowned Harris Tweed company gives an exciting new dimension to the British label, with subtle Harris Tweed inserts at the shoulders becoming one of the signature pieces of detailing for AW13. Peregrine’s rich mustard, navy and burgundy knitwear reinforce the British heritage aesthetic whilst more jovial retro striped sweaters encapsulate the light-hearted nature of the brand. Made from 100 per cent merino wool or a 50/50 blend of merino and British wool, Peregrine’s knitwear offers the best of both style and practicality. Key outerwear pieces, full of function and finesse, come in the form of the ‘Baxter’ jacket and an improved fisherman’s ‘Cagoule’. 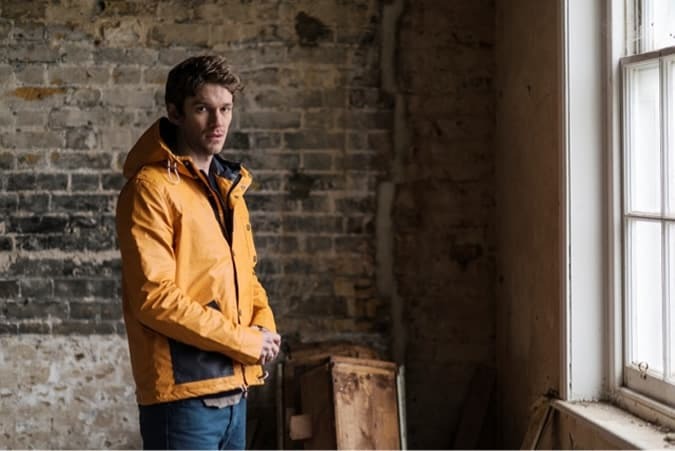 The hooded Baxter jacket – made from Vachetta 6 wax with rear shoulder vents, elbow pads and drawstring waist – is ready to face elements from both a climate and style perspective, whilst the Cagoule, in this season’s must have colour, vibrant orange, features contrasting navy pockets and provides all-year protection due to its British Millerain Vachetta Wax Cotton construction. With the accompanying lifestyle imagery featuring guitarist Jesse Wood, son of Rolling Stones legend Ronnie Wood, the brand strikes the perfect balance between strong family ties and British heritage – the definition of the Peregrine customer. It also helps that the Rolling Stones are quite possibly one of the greatest bands in British rock ‘n’ roll history. With Peregrine expanding into the Japanese market but keeping its production base firmly in the U.K., you can be rest assured that the quality of construction and the brand’s roots will continue to flourish. You can shop the new collection at peregrineclothing.co.uk.